In South Florida, you have to be careful with your skin year round. Even in the winter months, the tropical sun and humidity can take their toll. This year, forecasters are predicting a mild, rainy winter, influenced by an El Niño weather pattern. So that means it’s more important than ever to protect and treat your skin with kid gloves… and effective products. Most people love to bask in the sun, especially at the beach. 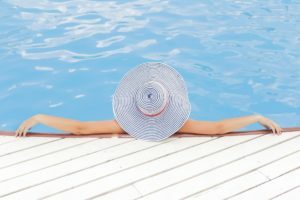 But the risks are high for sunburn, sun poisoning (which can result in scarring), premature aging, wrinkles and the biggie: skin cancer, including melanoma, which can be life threatening. So first let’s talk about how to protect yourself. The best thing to do is stay out of the sun, but that’s probably not a reality here in Paradise. There are a number of ways to protect yourself when exposed to the sun’s rays. What you wear for example. A hat that shades your face, sunglasses (which also protect your eyes) and protective clothing are all easy solutions. When it comes to skin products, choose sunscreen to apply daily that has an SPF (sun protective factor) of 30, and higher if you’re on the beach, tennis court or golf course. Same goes for lip balm. Here at Reflections, our line of Glymed products includes a number of effective products, including tinted sunscreen, which also covers up skin imperfections. Glymed Ultra Hydration lip balm is an excellent product. Glymed’s Tizzo 3 is a mineral broad spectrum sunscreen with an SPF of 40 and contains titanium and zinc oxide, all great for protection. If you do get sunburned, treat your skin with Aloe Vera or Glymed Plus Hydrogel, both of which should be kept in the refrigerator so they cool you down too. For more severe damage or areas of concern, seek medical attention. Humidity creates high risk factors just like the sun, and especially if combined with higher temperatures. It can lead to sweat and oil production, which can clog pores and result in acne breakouts. It also promotes the growth of bacteria and mold, resulting in skin irritation and redness. Combined with high heat, the moisture can cause heat rashes and blistering. If you experience oiliness as a result of humidity, we recommend the Glymed Plus 2% salicylic astringent, or you can purchase witch hazel over the counter. For heat rash, try Glymed’s GMP Comfort Cream with 2% hydrocortisone. Often, heat rash will disappear in 3-4 days untreated. For blistering, try this home remedy: ½ apple cider vinegar and ½ water chilled applied with cold compresses. If pain, swelling, swollen lymph nodes, fever or chills occur, be sure to talk with your doctor. So, if you think Paradise is bliss…. well, you’re right as long as you take care of yourself and your skin. Lose Inches, Gain Energy with Nutrient Body Sculpt Take Advantage Of Our End Of Year Sale!